Home › advertising › Social Networking: What's in it for You? These days, most businesses have at least considered integrating one or more of the social networking platforms into their marketing plan. Facebook and MySpace currently dominate the marketplace, Facebook holding a commanding lead with nearly 120 million unique users (a 69% gain in users since 2007), and 100 million of those users logging in on a daily basis. Facebook is especially appealing to business owners whose market aligns with Facebook’s user-base: women, and to a lesser degree men, between the ages of 35 and 44 years. 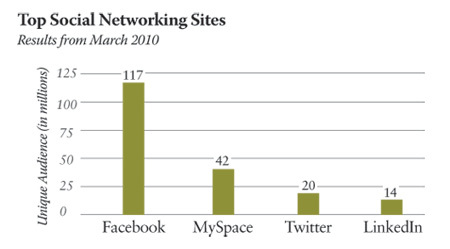 MySpace dominates the youth market with 42 million unique users (a 30% loss from 2007), whose median market age is 26 years. Twitter has 20 million unique users generally between the ages of 25 and 34 years. The existing data on Twitter’s popularity can be misleading. While Twitter attracted a significant amount of hype as it boasted dramatic growth over the past three years, new research suggests that nearly 60% of Twitter account-holders abandon their accounts soon after signing up. So which platform is right for your business? Facebook, at this point, is a no-brainer. Their enormous user-base is ideal for most marketers. The level of commitment required to maintain a Facebook page is comparatively reasonable, and the willingness of readers to respond to your posts is high. Setting up a Facebook fan page is easy, and can be easily integrated into your existing marketing efforts. For example, including a link to your Facebook page in your e-mail marketing campaign can result in large numbers of new friends. Once you’ve attained a strong following, update regularly, include images, and don’t forget to link your website on your Facebook info page. Blogging is also considered a social networking platform. A study from Synovate found that 4 out of 10 Americans read blogs every week (that’s a lot of people!) and of that group, 46% percent read their favorite blogs on a regular basis. As the most established social platform, “blogging” is a concept that is understood by all age groups and markets. Blogging offers unique benefits and unique challenges alike. While a blog offers a custom, fully branded space in which to present your posts, bloggers are especially obligated to update on a regular basis and flesh out the content of their posts more thoughtfully than those participating in Facebook, et al.